Note: Not all 3G/3.5G phones are created equally and each have a maximum 3G speed that it can obtain. 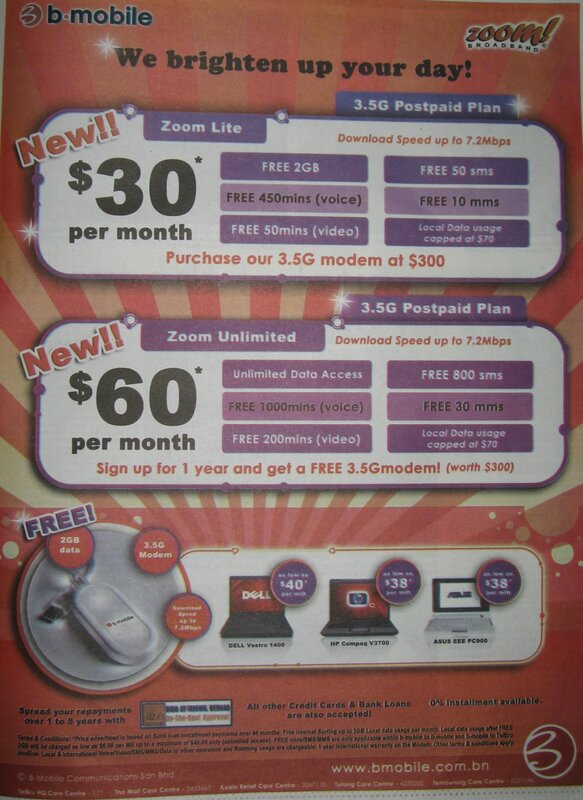 These details can be obtained online from places such as GSMArena.com. E.g. Nokia 6680 max 3G speed of 384 kbps, Nokia E51: max speed of 3.6 Mbps. As the guy from Berakas continues to do us a great service I thought I’d help chip in with this Google spreadsheet Mobile Broadband Speeds Tests – Brunei: Comparisons (http://snipurl.com/gozoom). 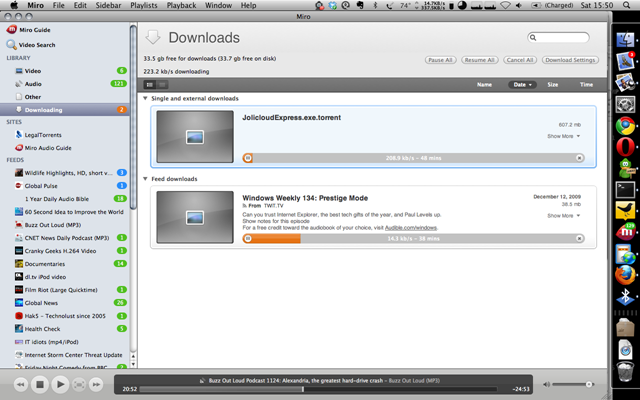 So we people in Brunei finally have mobile broadband. For those who don’t know b-mobile launched their Zoom! service on the 4th April 2008 and now we have DST’s competing solution of GO! which was introduced on the 1st of May. Both are based on HSDPA which is a 3G protocol and require a 3G capable SIM card that allows voice, SMS and data. When I first heard about Zoom! 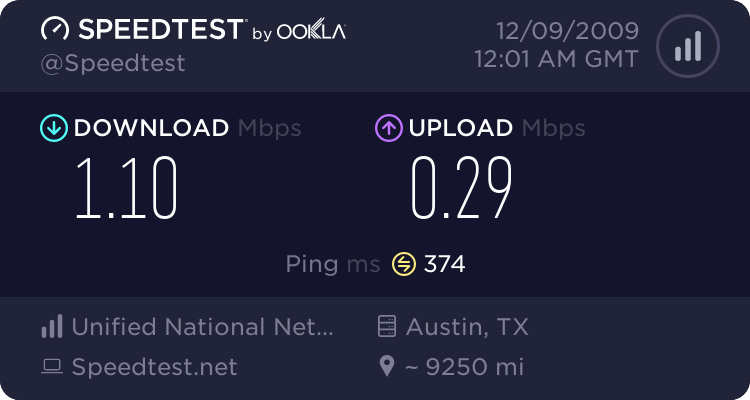 a month ago with its “up to” 3.6 Mbps connection I was intrigued and interested (which mobile warrior wouldn’t be?) so I went down to their road show at the Mall. 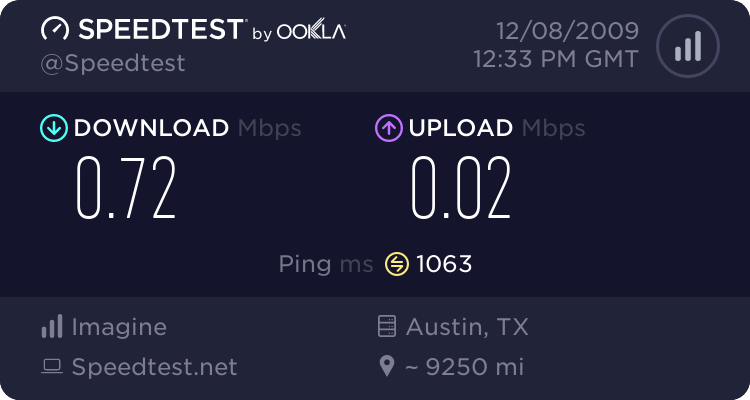 So I went up to the guy to ask a few questions and he told me that there was 3 different speed tiers something like 1Mbps, 3.6 Mbps and something else that I can’t remember. After talking the one of the guys at their booth in the 2nd Brunei Consumer Fair last night I was told that they indeed do NOT have any tiers: just a single 7.2 Mbps (upgraded from 3.6 Mbps to meet the competition). Talk about misinformation. And the guy didn’t even want to tell me the prices plans. The guy was a bit unsure of the product as I asked if I needed to install special software for the device and whether it was cross platform and he said no. So I asked him if I were to boot into OS X or Linux would it work as well? Then he said something like no you need to install software from the CD. I take it, he was talking about the drivers but I honestly wonder how good is the Linux support as it does seem that they have Windows & Mac support which is nice but more on this later. So initially the Zoom! 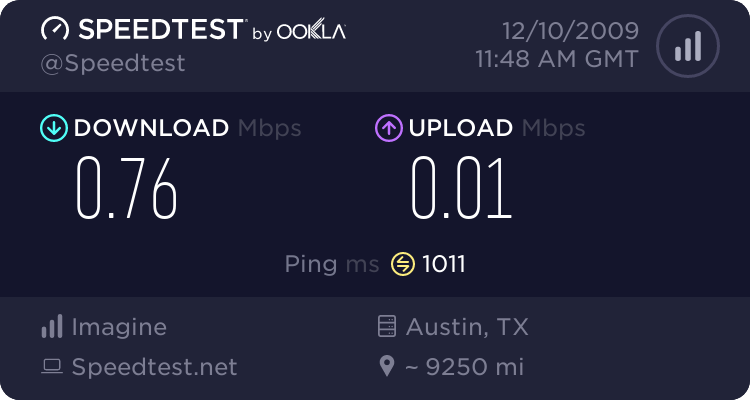 package is 3.6Mbps with 2GB of free data and $0.50/MB after the free usage. That how I read it until I went to the fine print or the FAQ page where it says that there is a cap of $40 on the excess data charges beyond which you are not charged, i.e. in other words for those who download loads of stuff it’s basically base price + $40 for unlimited usage. Now there comes to my other problem I had. What is the base price? It is not the listed on the website. Only after talking to them last night I found out the monthly charge just for the service is $59! So in total that would be $99 (at most) for unlimited data. So come the 1st of May and GO! 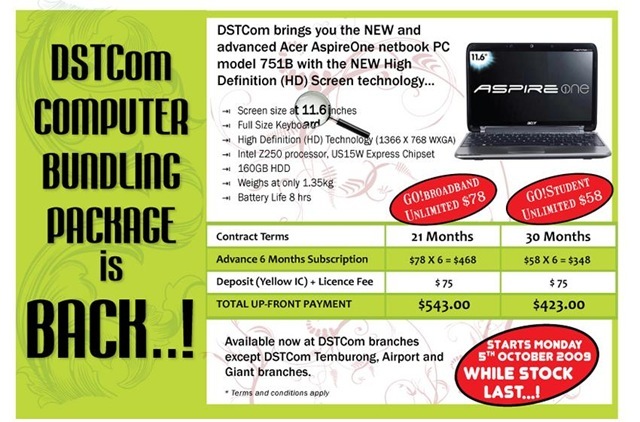 arrives and we get to see what offerings DST has up their sleeve has they had practically a month to see how Zoom! did and to strategize in order to compete. And after getting the details (all online I might add, as Jerudong Park Amphitheatre is a pretty long way to go just for the roadshow, and I just don’t have the time right now) I can say that they have indeed put up a great offer. 2 distinct plans: Basic and Unlimited (nice to see that they actually defined it properly). Prices for the basic: $38 with 2GB free data after which it’s $0.20/MB. The bill is capped at $88 (after which I assume it’s unlimited data) while the Unlimited package goes for $78. Both come with a free Simpur email account which is nice but nothing fantastic (Unlimited plan gets you Simpur Email Alert, which I guess is SMS to your phone?). Now both solutions offer package deals with laptops and such but GO! even has a package with a wireless router (Ericsson W25 Router) that even has USB ports that support both print server and mass storage (and it better considering it cost’s $600)! b-mobile offers a Dell Vostro 1400 / HP Compaq V3700 / Asus EEE PC900. Yup that’s right the EEE PC900!! When I saw that In the papers on Friday I was estatic so I went there and only found a 701 so I was about to ‘scold’ them for getting my hopes up but decided not to. I asked them to show me how it work’s on the EEE but conveniently they didn’t have a modem to test it with. They didn’t have a modem to test it with? At a road show where you are supposed to be demoing the product? Perhaps the modem broke or something like that but still I doubt there is a good excuse for it. The guy did tell me that it does work in Linux but how true can that be if I dont’ see it before my very eyes. Now it has dawned on me I think they mean the 701 NOT the 900 because in specifications listed from a brochure they handed out it says “Intel Celeron 900MHz, 512MB RAM, 4GB SSD Drive, Display size 7″, Resolution 800×480”!!!!!!! Man and this isn’t the first time advertisement isn’t just right. Me: Are you guys really giving out laptop? b.mobile guy: Well, no actually, we’re loaning laptops. Meaning, you will have to purchase our laptop and modem when you decide to subscribe to our service. Me: Never mind. Do I really have to buy your laptop when I subscribe? I mean, I already got one at home. Can I just buy the modem? b.mobile guy: I’m sorry, sir. You really need to buy the laptop too. Unless of course this is just another case of the people with wrong information / bad communication. But anyway so I was suprised to see in the papers today b-mobile response to GO! So all in all the following is a quick run down comparison of Zoom! and GO! Do not try to hide the facts this only adds suspician and confusion to your possible clients. E.g. prices: perhaps I can’t find a nice definitive monthly fee, so if there is one and I have missed it, my apologies. The brochure I got yesterday states that the Dell laptop is a “High Performance Multimedia Laptop”. Just give us the model number like the HP Compaq and Asus EEE PC (refer to last point). But this is nicely stated in the newspaper ad so why couldn’t it be in the brochure as well? Whoa super long post and that took quite a lot of my time but I guess it’s the technolust of wanting to be a true mobile warrior with my access on the go (on GO!… ok bad pun but whatever). My current toss-up between an Asus EEE PC 701 / Asus EEE PC 900 / HP Mini-Note 2133 / Macbook is making my head spin wanting good battery life but something small to carry. The Macbook is only there for easy video creation that’s all, unless Linux video editors have a major milestone (not that it is horrendous, in fact it’s pretty good what you can get for free, but there are some little annoyances that annoy me a bit too much). P.S. I wonder if it is possible just to use a regular 3G phone as a modem via AT commands and sorts thus bypassing a need for a modem entirely. That would be the best so you can use just your phone and anytime you want it on your laptop/computer just use a USB datacacble / bluetooth.